Classes Starting This Week — Enroll Now! 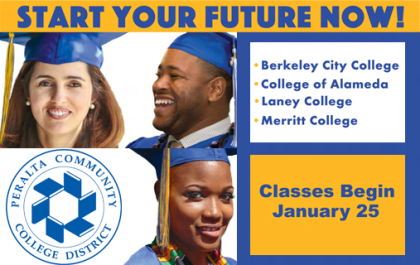 Classes are starting the week of January 25. Don’t miss out getting the classes you need. There’s still time to enroll. Check out our mobile-friendly class schedule at http://bit.ly/PeraltaSpring16Schedule and then click http://web.peralta.edu/enrollment-2/ to enroll. It’s not too late, enroll now!